Generates video patterns for testing VGA displays. The VGA Video Pattern Generator is a battery powered, portable, compact unit that generates video test patterns for evaluating VGA displays. Featuring 36 static and dynamic video test patterns, and 38 timings up to UXGA 1600x1200, the unit will quickly determine color performance and linearity. 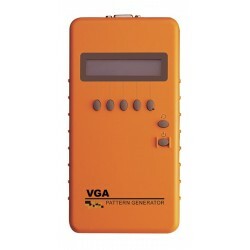 Easy to use five-button control of the on-screen menu through a 16x2 LCD screen. Includes a built-in rechargeable battery, power adapter, and a 1.2m VGA cable. Provides a total of 36 video test patterns and 38 timings, including color bar, gray, grid, block. Supports maximum 162 MHz pixel frequency. Supports H/V sync and sync on green (SOG). Compatible with any VGA interface. One female 15-HD connector for output. Supports 1920x1200 at reduced blanking. Reduced blanking saves bandwidth by reducing the blank period before and after each frame with no impact on output quality.